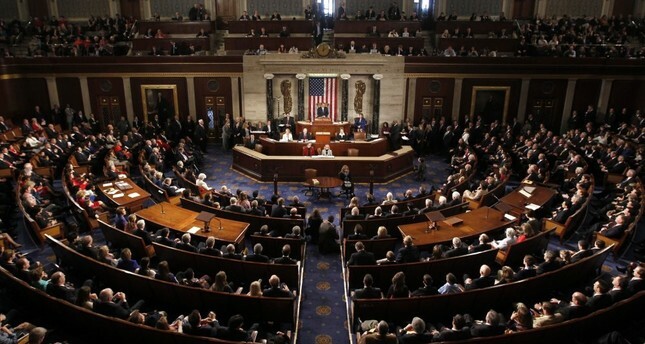 A resolution to recognize the 1915 events as "genocide" was introduced to the U.S. Senate on Wednesday. The last few days have witnessed the re-emergence of the 1915 events as a topic that tops the agenda of Western states, using "genocide" rhetoric one after another in a manner that aims to defame Turkey and its past. Receiving immediate reactions from Ankara, which strongly condemned these recent developments, the repetitive moves spanning a week on the same issue are regarded by many as a political tool targeting Turkey instead of ordinary decisions marking the significance of a historical event. First, the lower house of parliament in Italy passed a motion Wednesday calling on the Italian government to officially recognize the events of 1915 as "genocide," following a motion drafted by the far-right Lega Nord Party. The bill was approved with 382 votes in favor, none against and 43 abstentions, mainly from members of the opposition center-right Forza Italia party of former Prime Minister Silvio Berlusconi. Italy's government will have to follow up on parliament's mandate but is not legally obliged to do so. The proposal was voted on Wednesday and the motion was approved by 382 votes with none against and 43 abstentions. The Foreign Ministry yesterday strongly condemned the passing of a motion by Italy's Parliament to recognize the 1915 events in Armenia as "genocide." "The motion of the Italian House of Representatives dated April 10, 2019, is a new example of the use of Armenian claims as a tool for domestic political interest," the ministry said in a statement, underlining that the move is "strongly condemned." The ministry noted that the proposal was prepared by Italy's far-right Lega party, whose leader Salvini "is committed to sabotaging the relations between Turkey and Italy," stressing that the "allegations being brought up before the elections or in the context of opposition to Turkey clearly reveals the political nature of these allegations and that they are inconsistent with the historical facts." Foreign Minister Mevlüt Çavuşoğlu said on Twitter yesterday that the Italian Parliament's motion is null and void and added: "It is unacceptable that the Italian Parliament has become an instrument of the game played by the xenophobic Lega Nord Party that is seeking votes for the European Parliament." Turkey's presidential spokesman also slammed the passing of the motion. "The so-called genocide decision of the Italian Parliament ignores historical facts and sows new seeds of hostility," İbrahim Kalın said on Twitter. He added that the decision "fuels political populism." Turkey's position is that the deaths of Armenians in eastern Anatolia in 1915 took place when some sided with the invading Russians and revolted against Ottoman forces. A subsequent relocation of Armenians resulted in numerous casualties. However, this was not the only move the Italian far-right movement has taken against Turkey. Matteo Salvini, Italy's deputy prime minister and leader of the Lega Nord Party, pledged to cancel Turkey's EU accession on Monday when he hosted members of European nationalist and far-right parties in Milan to discuss forming a broad political alliance within the European Parliament. Salvini aims to unite all the far-right blocs of European politics under one broad alliance to gain the majority in the European Parliament and change the policies in favor of nationalist, anti-immigrant and far-right ideologies using populist rhetoric. The accession process of Turkey to the European Union is one of the biggest concerns for the alliance. Addressing the issue of Turkey's accession to the European Union, Salvini said talks with Turkey, which have been suspended, should be canceled. Salvini said he believes Turkey would be an Islamic influence in Europe and that the country is too different culturally. EU membership remains a top strategic goal for Turkey even though the accession talks, formally launched in 2004, have been stalled for years due to the objections of the Greek Cypriot administration on the divided island of Cyprus as well as opposition from Germany and France. Many believe that Turkey's membership application has been stalled for years due to its cultural and religious identity. Meanwhile, a similar process took place in the U.S. as a bipartisan group of U.S. senators also introduced a resolution Wednesday to recognize the 1915 events as "genocide." The "genocide" allegations came at a time when the U.S. and Turkey are increasingly at odds over their Syria policies and the Turkish purchase of the Russian-made S-400 missile defense systems. U.S. support for the Syrian Democratic Forces (SDF), dominated by the PKK terrorist group's Syrian offshoot, the People's Protection Units (YPG), remains the most contentious issue. Ankara's decision to buy S-400 missile systems from Russia has provoked warnings from Washington that the deal may impact its sale of the U.S.-made F-35 fighter jets to Turkey and trigger sanctions. It was also noted that this was the third bill against Turkey introduced to U.S. Congress in a week. In addition to the resolution to recognize the 1915 events, the bill to impose sanctions on Turkish officials responsible for the detentions of U.S. citizens and local consulate staff in Turkey on terrorism charges and the call to cooperate with Greece, Israel and Greek Cyprus in the Eastern Mediterranean were other examples of the recent political campaign conducted against Turkey in U.S.
France became yet another country to target Turkey through "genocide" claims as French President Emmanuel Macron announced the declaration of April 24 as a day to commemorate the so-called genocide. Çavuşoğlu said yesterday that Macron's decree "openly violated" both the decisions of the European Court of Human Rights (ECHR) and the Constitutional Council of France. "Macron is promoting populist rhetoric by trying to fulfill the promises he made to Armenians in his election campaign," Çavuşoğlu said on Twitter adding that France "should examine at its own dark history first," referring to the Rwanda genocide.